For more than 40 years the name URSAPHARM stands for the consistent transfer of innovative pharmaceutical conceptions. For over 40 years the name URSAPHARM stands for the consistent transfer of innovative pharmaceutical conceptions into successful medicine and medicinal products. 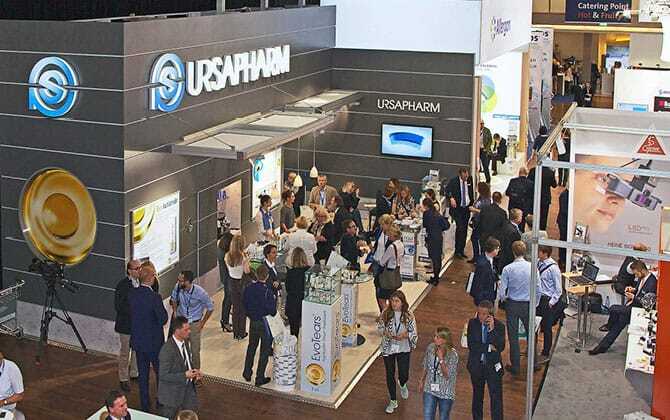 Today URSAPHARM is an international medium-sized concern and due to the large range of products it belongs to the market leaders in Germany in the field of ophthalmology. URSAPHARM is a company that like no other one in the Saarland stands for the successful combination of innovative capacity and tradition. Since the foundation in the year 1974 the pharmaceutical manufacturer has developed to a global operating group of companies. Numerous innovative products and patents secure the future of the company and offer excellent working conditions as well as promising future prospects to more than 500 highly qualified employees at the headquarters in Saarbrücken and in the distribution countries. With its own subsidiaries in France, the Benelux Countries, Austria, Poland, the Czech Republic, the Slovak Republic, Portugal, Russia and India as well as cooperation agreements with sales partners in over 74 countries URSAPHARM has developed in the last decades to a true global player that nowadays is working far beyond the local borders. Nevertheless the company has kept alive the relation to the homeland and the proverbial down-to-earth attitude. Today Frank and Dominik Holzer at the head of the company manage the destinies of the family business in the second and third generation.